Probably just because gravity lows are a nice deep blue and when you look at this on a regular map the Sea of Cortez is blue of course, but the Great Valley is green or brown and it is harder to see the similarity. It makes nothing but sense. North America has been in the vanguard of the advance of continents to reclaim the planet from the Panthalassic Ocean since the breakup of Pangea. Strike slip conditions like those that cause the San Andreas Fault today have prevailed for most of this period. Huge chunks of western North America are paleomagnetically out-of-place and the subject is so controversial that geologists are required to check their hammers at the door when they meet to discuss it. It is safe to say that generally slivers have been getting ripped off and sliding northward relative to the continent for a very long time. What seems to have happened is active spreading moved further south and the San Andreas system moved Baja California north, sealing the Sea of Central Valley off at the bottom in the form of the Transverse Ranges. 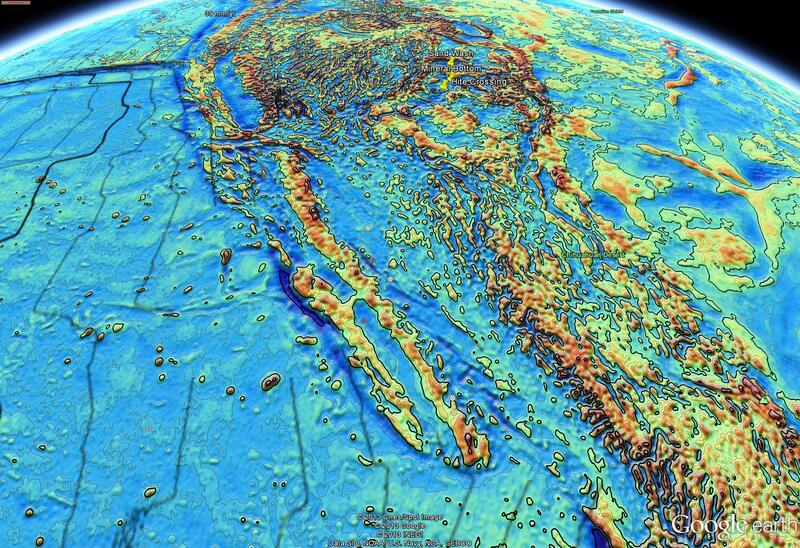 Active seafloor spreading in the Sea of Central Valley like that taking place in the Sea of Cortez today would explain the mysterious ophiolite (read ocean floor) sequences around the valley. Then again, it could just be a figment of my imagination. This entry was posted in Geography, Geology, Gravity Anomalies, Paleogeography, Plate Tectonics and tagged Baja California, Central Valley, Gulf of California, Pangea, Panthalassic Ocean, San Andreas Fault, Tectonic History California Central Valley. Bookmark the permalink. This is a nice image, but a poor analogy. The SAF was not present in the Cretaceous, and the Coast Range was certainly not there. There are fairly older ophiolites in the Sierra foothills, associated with collisions of several continental fragments. .The ophiolite fragments (serpentine) in the coast ranges are broken-up pieces of the latest-and-greatest subduction zone,which swallowed the Franciscan Fm. that lasted from the Jurassic thru the Eocene (and is still there in Oregon to Alaska). There is a big magnetic high in the central valley, that I think is attributed to serpentine body from that final long-term subduction zone. The Sea of Cortez is being wrenched apart, but California has had a history of pushing together and then sliding sideways. See what I mean? Check your hammer at the door. I’ve come to believe that the coast ranges did exist in the Mesozoic as an offshore system entirely separate from the Sierra Nevada. This is not to argue that they represent a shard of granitic craton exactly like Baja. An offshore system with its own Mesozoic volcanics and a backarc basin similar to the Sea of Cortez with a bit of spreading and a bit of strike would do the trick. Paleomagnetic evidence indicates the coast ranges have moved north relative to the continent. They just moved north until they hit the Klamaths and presto, you get the form. A year and half late to this one, but I agree with gymnosperm, albeit possibly from a different angle. Read “The persistent myth of crustal growth” by R. L. ARMSTRONG (1991) http://www.mantleplumes.org/WebDocuments/Armstrong1991.pdf and An Alternative Earth” by Warren B. Hamilton ftp://rock.geosociety.org/pub/GSAToday/gt0311.pdf for my reasons. The case of late differentiation of the Earth continental crust is not convincing to many, and a growing number of researchers are accepting that existing crust is not “net new” crust, but “surviving” (having always been at or near the surface, yet part of the lithosphere). Did continents really begin as little seeds of protocontinents that “grew” from those states to their present states? That’s one hypothesis arising from plate-tectonic theory, but since PT still lacks a convincing driving mechanism the idea of continents episodically “growing”, on net, remains to be proved. To say that “SAF was not present in the Cretaceous, and the Coast Range was certainly not there…” is not true in the absolute, unless we conclude that NO crust was “there” (given crustal motion on the whole). The mass that makes up those younger crustal regions most certainly existed – somewhere, and in some form. The only question is where, and nobody can say with any certainty where that was, or that it was not part of the upper lithosphere all along. Stephen, I may be slowly coming around to your more static viewpoint. It is easy for me to write off the paleomagnetic data as crystallization following a moving pole, but the GPS measurements of recent motion are more troublesome. I also have a problem with the magnetic lineation in the ocean floors. One can argue that it is just basalt that slurped out over preexisting structures but that is a loooong way to slurp.